"Massachusetts Deaths and Burials, 1795-1910," database, FamilySearch (https://familysearch.org/ark:/61903/1:1:FHDH-BH5 : 10 December 2014), Elsworth A. Winslow, 08 Aug 1893; citing , reference 716; FHL microfilm 1,976,852. "Massachusetts Births, 1841-1915", database with images, FamilySearch (https://familysearch.org/ark:/61903/1:1:FX65-ZDZ : 1 March 2016), Elsworth A. Winslow, 1893. "Massachusetts Deaths, 1841-1915," database with images, FamilySearch (https://familysearch.org/ark:/61903/1:1:NW9Y-28Z : 10 December 2014), Elsworth A. Winslow, 08 Aug 1893; citing Lynn, Essex, Massachusetts, v 436 p 494, State Archives, Boston; FHL microfilm 961,509. "Massachusetts Births, 1841-1915", database with images, FamilySearch (https://familysearch.org/ark:/61903/1:1:FX4K-SY1 : 1 March 2016), George Washington Winslow, 1894. "Massachusetts Births, 1841-1915", database with images, FamilySearch (https://familysearch.org/ark:/61903/1:1:FXFD-TVG : 1 March 2016), Henry Winslow, 1903. "Massachusetts Deaths, 1841-1915," database with images, FamilySearch (https://familysearch.org/ark:/61903/1:1:NWNV-77H : 10 December 2014), Edith A. Langley Winslow, 01 Jan 1904; citing Cambridge, Massachusetts, v 28 cn 3, State Archives, Boston; FHL microfilm 2,069,444. "United States Census, 1900," database with images, FamilySearch (https://familysearch.org/ark:/61903/1:1:M9RY-Q26 : 6 March 2015), Henry B Windslow, Cambridge city Ward 2, Middlesex, Massachusetts, United States; citing sheet 9B, family 196, NARA microfilm publication T623 (Washington, D.C.: National Archives and Records Administration, n.d.); FHL microfilm 1,240,656. "Massachusetts Marriages, 1841-1915," database with images, FamilySearch (https://familysearch.org/ark:/61903/1:1:N44F-H8G : 17 February 2016), Henry B Winslow and Edith C Langley, 25 May 1892; citing Saugus, Essex, Massachusetts, United States, State Archives, Boston; FHL microfilm 1,651,233. "Massachusetts Births, 1841-1915", database with images, FamilySearch (https://familysearch.org/ark:/61903/1:1:FXFH-17N : 1 March 2016), Winslow, 1900. "Massachusetts Births, 1841-1915", database with images, FamilySearch (https://familysearch.org/ark:/61903/1:1:FXH6-Y7J : 1 March 2016), Edwin Langley Winslow, 1901. "New Hampshire Marriage Records, 1637-1947," database with images, FamilySearch (https://familysearch.org/ark:/61903/1:1:FLXF-1Z8 : 12 December 2014), Simon Perkins Colby and Betsey Wood, 31 Dec 1818; citing Weare, Hillsboro, New Hampshire, Bureau of Vital Records and Health Statistics, Concord; FHL microfilm 1,000,976. "New Hampshire Birth Records, Early to 1900," database with images, FamilySearch (https://familysearch.org/ark:/61903/1:1:FL2R-RR6 : 12 December 2014), Hannah Wood Colby, 16 Jun 1819; citing Weare, Hillsborough, New Hampshire, United States, Bureau of Vital Records and Health Statistics, Concord; FHL microfilm 1,000,378. "New Hampshire Birth Records, Early to 1900," database with images, FamilySearch (https://familysearch.org/ark:/61903/1:1:FL2R-B4J : 12 December 2014), Juliana Perkins Colby, 02 Jun 1823; citing Weare, Hillsborough, New Hampshire, United States, Bureau of Vital Records and Health Statistics, Concord; FHL microfilm 1,000,378. "New Hampshire Birth Records, Early to 1900," database with images, FamilySearch (https://familysearch.org/ark:/61903/1:1:FL2R-PHP : 12 December 2014), Eliza Jane Colby, 06 Feb 1826; citing Weare, Hillsborough, New Hampshire, United States, Bureau of Vital Records and Health Statistics, Concord; FHL microfilm 1,000,378. "New Hampshire Birth Records, Early to 1900," database with images, FamilySearch (https://familysearch.org/ark:/61903/1:1:FL2R-R26 : 12 December 2014), Hepsey Wood Colby, 04 Mar 1830; citing Weare, Hillsborough, New Hampshire, United States, Bureau of Vital Records and Health Statistics, Concord; FHL microfilm 1,000,378. "New Hampshire Birth Records, Early to 1900," database with images, FamilySearch (https://familysearch.org/ark:/61903/1:1:FL2R-181 : 12 December 2014), Lucy Ann Colby, 19 Mar 1832; citing Weare, Hillsborough, New Hampshire, United States, Bureau of Vital Records and Health Statistics, Concord; FHL microfilm 1,000,378. "New Hampshire Birth Records, Early to 1900," database with images, FamilySearch (https://familysearch.org/ark:/61903/1:1:FL2T-SBL : 12 December 2014), Susan Maria Colby, 09 Jul 1835; citing Weare, Hillsborough, New Hampshire, United States, Bureau of Vital Records and Health Statistics, Concord; FHL microfilm 1,000,378. Joanna Wood was born perhaps about 1676. 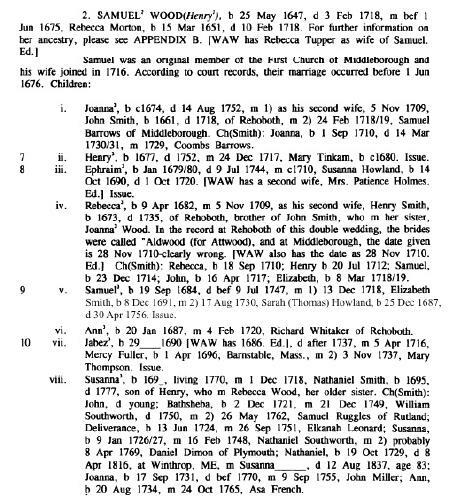 "Massachusetts Births and Christenings, 1639-1915," database, FamilySearch (https://familysearch.org/ark:/61903/1:1:VQ6G-QBZ : 4 December 2014), Rebecca Wood, 09 Apr 1682; citing MIDDLEBORO,PLYMOUTH,MASSACHUSETTS, ; FHL microfilm 0001250 V. 1, 0001250 V. 2, 0001250 V. 3, 0001251 V. 4, 0001251 V. 5, 0161967 V. 6, 0161967 V. 7, 0161967 V. 8, 0161968 V. 9, 0161969 V. 12, 0161969 V. 13, 0161969 V. 14, 0161970 V. 15, 0161970 V. 16, 0161970 V. 17, 0161971 V. 18, 0161971 V. 19, 0161971 V. 20, 0161972 V. 22, 0161972 V. 23, 0161972 V. 24, 0161972 V. 25, 0161973 V. 26, 0161973 V. 27, 0161973 V. 29, 0161974 V. 30, 0161974 V. 31, 0161974 V. 32, 0161975 V. 33, 0161975 V. 34.